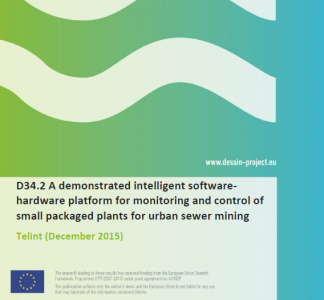 Deliverable D34.2 contains the results of Task 34.3 of DESSIN Project which is related to Athens Demonstration: Sewer Mining for Urban Reuse enabled by Advanced Monitoring Infrastructure. As the actual deliverable is of a nature that can not be submitted electronically to the EC services, it is accompanied by this report which summarizes the results of T34.3 “Implement the monitoring and supervisory system”. It focuses on the implementation of the the intelligent software-hardware platform for monitoring and control of small packaged plants for urban sewer Mining. It documents the implementation detais for of the SW and HW platform for collecting, processing and visualizing field sensors installed at the packaged plant in KEREFYT, the Sanitary Engineering Research and Development Center of EYDAP. The front-end and back-end implementation aspects are described including the adoptation of OGC standarts, the data models and encodings used, the cloud based User Interface, the web technologies and web services implemented. The platform presented has been integrated and tested at KEREFYT and is fully functional and operational.